Just published is “a cookbook written by Ev’s grandmother and a curated collection of Peg’s favorite recipes” which are “Family-tested” called Heirloom Recipes from Pleasant View Farm 1891-2000 by Margaret Vedder Rau with Laura Shore (Farm Share Studio Press, Altamont, NY 2016). 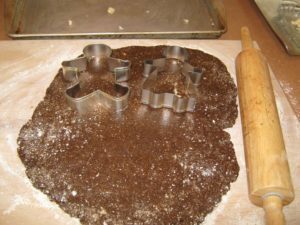 The recipe for gingerbread boys comes from Peg Rau’s mother-in-law, Margaret Rau and caught my eye. How neat to bake up a dozen gingerbread boys for the Christmas holiday. 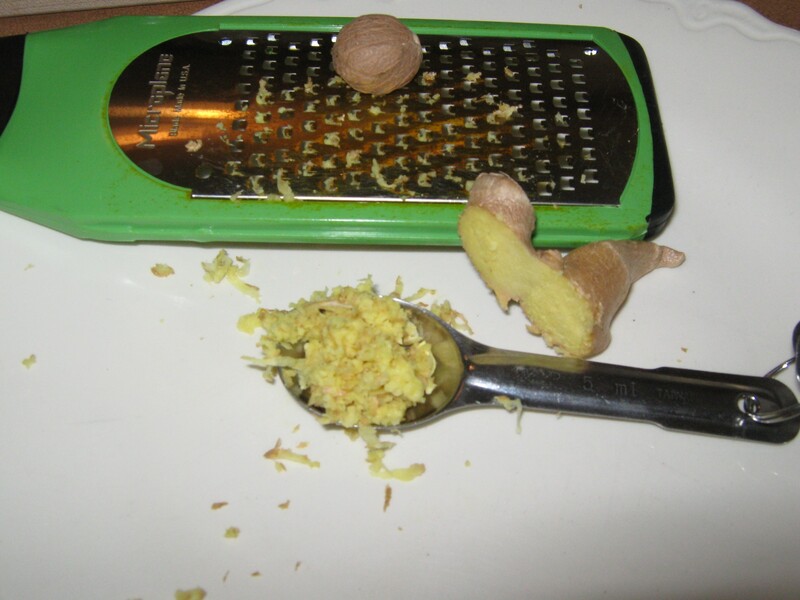 Margaret Rau’s recipe inspired some tinkering around the edges and the use of all organic ingredients, as well as both freshly grated ginger and nutmeg, as well as ground ginger and cinnamon, more typically used in baked goods. The cookbook’s recipe said it would make for 9 to 12 Gingerbread Boys, but even though I used the low end of 4 cups of flour (from the recipe’s recommended 4 to 5 cups), I ended up with 12 gingerbread boys plus a gingerbread mom and gingerbread dad and even an additional round gingerbread cookie, for a quick snack shortly out of the oven. 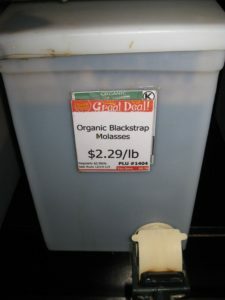 In a large bowl, combine 1 cup molasses and 1/2 cup water. And continue adding ingredients in the order noted above. Mix thoroughly. I did so by hand, and after using four cups of flour, the dough seemed ready for rolling out. As noted above, I substituted butter for the 1/2 cup of shortening shown in the Pleasant View Farm heirloom recipe. Vegetable shortening contains no water, but butter does, so it takes slightly more butter if butter is used instead of shortening. 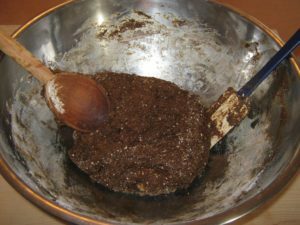 MyRecipes.com, which features a large collection of professionally-tested recipes, recommends using 1 cup plus 2 tablespoons of butter for 1 cup of shortening. With a handy rolling pin, I rolled the dough to roughly 1/4 to 1/2 inch in thickness on a lightly floured breadboard. And then using gingerbread cookie cutters in three shapes, which I purchased at Different Drummer’s Kitchen, a terrific cooking store and cooking school, I cut out 12 gingerbread boys, a dad and a mom, as well as hand-forming a round cookie to enjoy soon after the treats were pulled out of the oven. On greased cookie trays, bake at 375 degrees in preheated oven for 12-15 minutes. 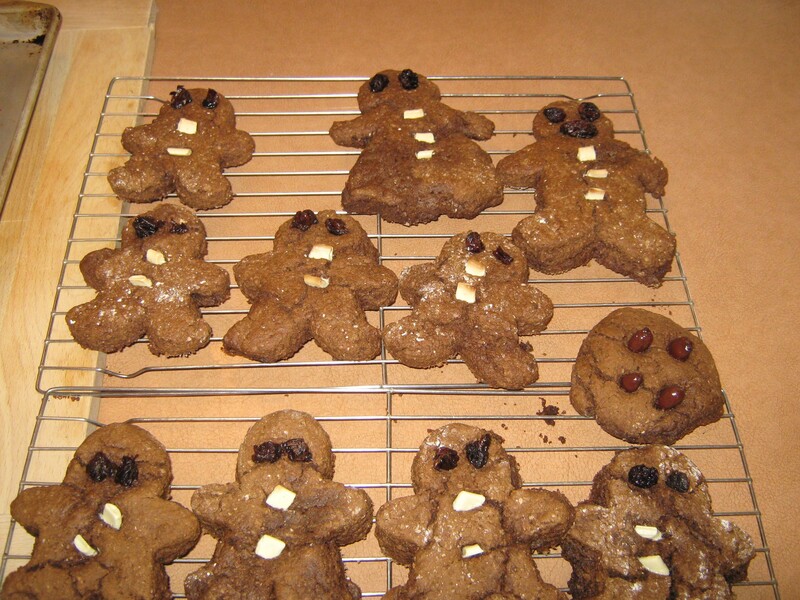 Then again baking up a batch of gingerbread boys was prompted by a memory of my mother, long gone, who was a handy baker of these gingerbread treats. And hard not to smile at seeing the dozen delicious cookies come out of the oven with their cartoon-like shapes. My 100% organic ingredients were all obtained from the Bulk Food department of the Honest Weight Food Co-op in my hometown of Albany, New York. Why organic? Check out one of the first book reviews posted on this website of Maria Rodale’s Organic Manifesto. 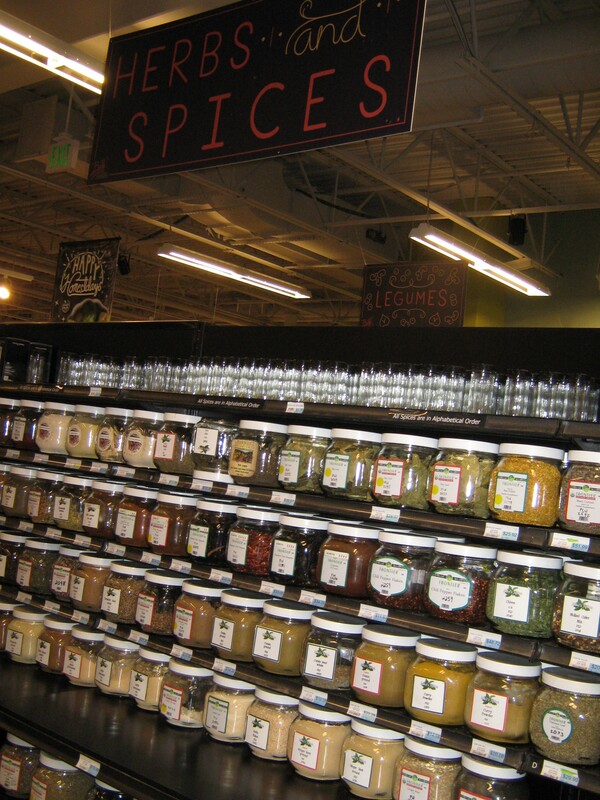 Why bulk food? The Bulk Is Green Council is helping to spread the message about the many environmental and economic benefits of bulk foods. 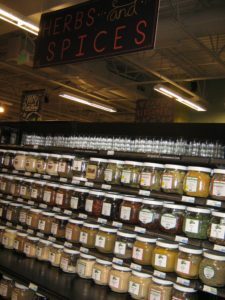 In addition to the molasses, the ginger rhizome, ground ginger, whole nutmeg, cinnamon, baking soda, and flour (Farmer Ground whole wheat pastry flour, a fresh, stone ground flour from New York State organic grain) were purchased from the co-op’s remarkable Bulk Food Department, with its nearly 1000 bins of bulk foods. The co-op’s cheese and dairy department sells a local farmstead butter made by Kriemhild Dairy of Hamilton (Madison County) in upstate New York from milk of grass fed, pasture-raised cows, which added to the buttery richness of the gingerbread boys. By mistake, I purchased salted butter instead of the sweet butter from the dairy also available at the co-op, so I did not add the 1/4-1/2 tsp of salt shown in the recipe’s list of ingredients above. I decorated the boys with organic flame raisins and white chocolate chunks also purchased in the co-op’s bulk foods department. And the extra round ginger cookie was decorated with Tierra Farm dark chocolate tart cherries. So delicious, if I made the recipe again, they would also be used to decorate the gingerbread boys!